Two years ago, Amazon first announced its plans to integrate delivery drones in its distribution supply chain. Now, the online retail giant has officially revealed the prototype designs for the drones, which will be used for "Prime Air." On Sunday, the company released a promotional video led by Jeremy Clarkson, the former host of "Top Gear." Clarkson explained that, though the project is still in its early stages of development, there will eventually be various drones designed for specific environments. Amazon also clarified how these drones, a hybrid design between a helicopter and an airplane, will operate. In addition to making it possible to have deliveries made in as little as 30 minutes, the Unmanned Aircraft Systems will also have a travel distance up to 15 miles and an altitude reach of 400 feet. Amazon, as well as other companies interested in using UAS to transport packages, will face a number of obstacles. For example, birds, the weather and other natural elements may prevent seamless delivery. According to a Stratford Global Intelligence analysis, the use of aircraft systems for commercial delivery will likely enhance the efficiency and effectiveness of inventory and distribution management, as well as give companies a platform to test additional delivery systems. However, it could also present a number of complications along supply chain checkpoints, especially with tracking and distribution processes. Spend Matters contributor Joel Johnson pointed out that the use of aerial delivery systems will affect supplier relationship management as well. Companies will rely less on logistics providers for distribution, while increasing investment in urban warehouse development. The Amazon Prime Air team has conducted trial runs, but no actual deliveries have been made yet since the Federal Aviation Administration has prohibited the use of commercial drones until regulations are in place. U.S. Transportation Secretary Anthony Foxx and FAA Administrator Michael Huerta released a statement that said a task force of approximately 30 representatives has been created to develop registration regulations for UAS. "Registering unmanned aircraft will help build a culture of accountability and responsibility, especially with new users who have no experience operating in the U.S. aviation system," Foxx stated. "It will help protect public safety in the air and on the ground." Huerta added that these regulations are much-needed, considering the agency has received an influx of reports pertaining to dangerous UAS operations. 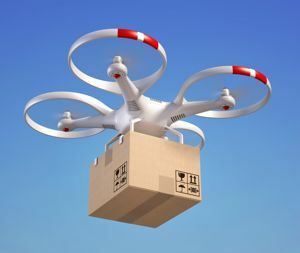 Though it will probably be years before these small aircraft are used for commercial purposes, it is likely consumers will see other major retailers developing similar plans for drone delivery and pickup services.